Remember that Chuck Norris column that effectively served as an announcement of WorldNetDaily editor Joseph Farah's new book, and which Farah played off as jumping the gun since the book wouldn't be coming out for another six months? Well, we're seeing that this is all a very calculated campaign led by Farah to promote his book -- and raise money to publish it. Researched and written by Joseph Farah over the last three years, the unique book officially releases in September following a grass-roots funding effort designed to provide the companies with the financial resources to print a first run of at least 100,000 copies to meet what is already projected to be massive demand from the public. Among those endorsing the book are Franklin Graham, Mike Huckabee, Chuck Norris, Greg Laurie, Jack Van Impe, David Barton, Dinesh D’Souza, Jonathan Bernis, Michael Brown, Sid Roth and Ray Comfort. The campaign to support the book permits both free-will, non-deductible donations as well as tax-deductible contributions through an allied non-profit. The article is illustrated with the cover of the "Special VIP Advance Reader Copy" Farah has sending to those Christian leaders to create buzz and, presumably, troll for blurbs. While ministries around the country are eagerly awaiting the release of the book, which has already been approved for sale by Franklin Graham for the Billy Graham Library and being considered now for sale in the Museum of the Bible, WND and WND Books does not have the financial resources to print the first 100,000 books, which will cost over $200,000. There’s also a long delay in actually receiving the money in book sales. Bookstores make big orders – essentially on consignment. It’s not unusual to be receiving revenues from actual sales six to 12 months later. Since this book is what is called an “evergreen” in the industry, the book is sure to sell for many, many years – because there is no competition in the marketplace and because the substance of the book never changes or becomes outdated. But WND also currently has no advertising budget to support this book – something that would result in the word getting out for faster sales. So, the need is great – beyond $200,000. That’s just a start. Can you help WND raise at least $200,000 right now with your tax-deductible contributions or your free-will non-deductible gifts directly to WND so we can help spread this vital Gospel message? WND doesn't explain why the first printing needs to be 100,000 copies, nor doesn't it explain why it doesn't do a slow rollout of the book instead, using profits from that printing to pay for more copies. 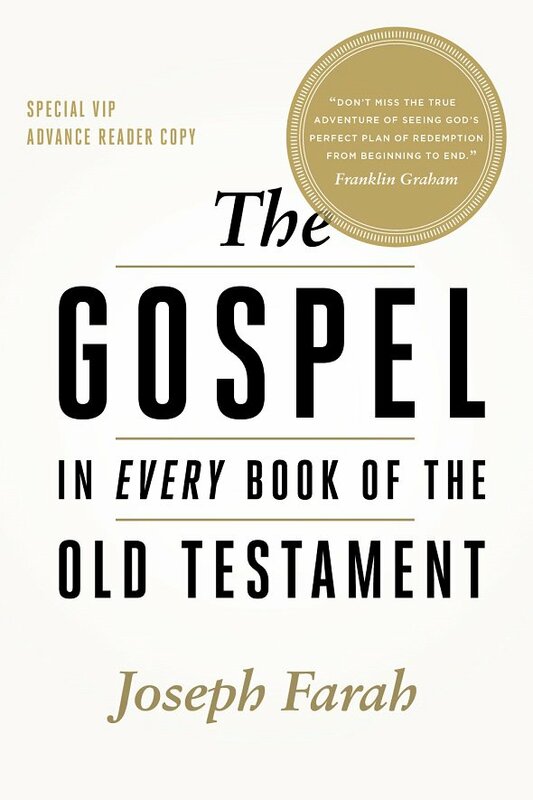 We invite you, your organization or church to become a patron for “The Gospel in Every Book of the Old Testament” by making a tax-deductible grant or donation of $10,000 or more to the “The Gospel Book Project” direct to Gospel for All Nations by special arrangement with author Joseph Farah who wants to hear from you directly. Donors will also shortly receive a pre-publication collector edition Special Advance Reader Copy signed by the author as well as an autographed first edition copy that will include the list of patrons, if they so choose to be listed. If you are in a position to arrange such a grant or donation, please email the author at jfarah@wnd.com to set up a personal briefing, thanks and instructions. Gospel for All Nations is a ministry -- seemingly consisting of just a man, his wife and their daughter -- that, according to its website, "exists to take The Gospel of Jesus to the nations of the world, focusing in particular on the least reached nations." It's unclear what, exactly, the connection is between Gospel for All Nations and Farah and WND. An April 23 WND article features more testimonials for the book and another plea for funds. It seems that begging WND readers for money to keep his operation afloat agrees so well with Farah that he's doing it again -- but with the added twist of tax-deductible contributions through a nonprofit ministry through a relationship that has not been publicly defined. At least donors get a tangible book out of the deal. Hey, at least it's not bitcoin.